I've often thought that it would be cool to work for the art department of a snack company. You can come up with all sorts of kooky mascots for equally kookily (not actually a word, I know) named products. 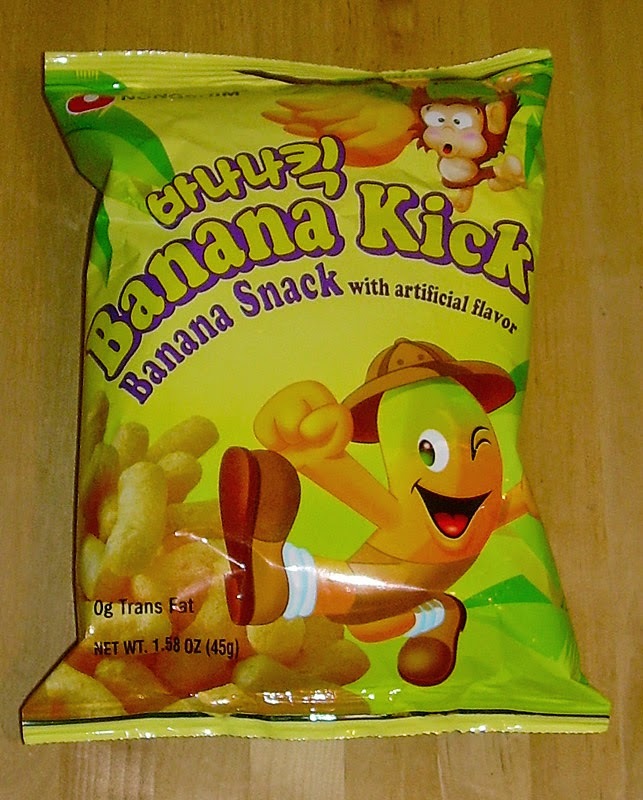 I'm sure someone sat around frowning in concentration to come up with a banana that is kicking into the air at an invisible soccer ball when pondering this bag's design. The "genuis" of this design isn't the anthropomorphic 'nana. No, that was easy. The hard part was deciding his attire, and, I'm sure, if he might have been a scandalously nekkid banana. I'm sure there was much more frowning and thinking as the designer came up with a little word association to think of what to do besides put on a flirtatious and energetic-looking banana. You could imagine him saying, "hmmm... hmmm... (though likely he said "hmmm..." in Korean since this is a Korean product)... bananas... banana split... banana boat... banana peel... bananas shake... bananas and... bananas and monkeys! Yes, who doesn't associate monkeys and bananas? So, we've got a monkey. Why would a banana hang out with a monkey? Well, he must be on safari. Yay! Ideao acquired! Now that I've gone through the sophisticated creative process, I'm far less certain of the cool factor of working in the art department of a snack company. Perhaps it would be better to design the flavors or food varieties, but that's a post for another time. I've procrastinated long enough and it's time to talk about the actual food contained within the bag. I bought these because, frankly, they sounded awful. I picked them up at a Korean market for about a dollar and I did it because it was too strange not to. 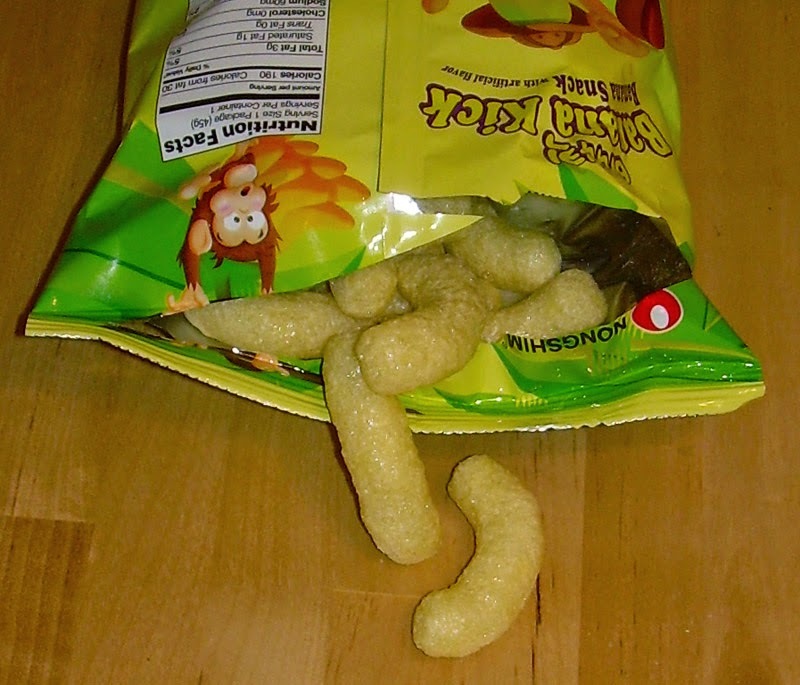 It's not strange because it's banana, but rather because it's a banana salted snack puff. We don't tend to put fruit flavors on our puffs here, so this seemed like a chance to try something quite different. I assumed this would be sweet, and I'm not exactly a stranger to sweet corn puffs after living in Japan for awhile. It is sweet and has a strong, but not particularly fake, banana flavor. The puffs themselves are super light and crispy. I've had this bag sitting around for more than 2 months, but it stayed fresh (shockingly). That being said, the date was July 11, 2014, so I beat the expiration. Of course, it was sealed. The banana aspect of these reminds me a great deal of the type of banana chips that are shellacked with sugar on the outside and that people eat because they are supposed to be healthy. There is also an undercurrent of basic corn puff flavor. This could be a cereal, except that it is sweeter than even something like Cap'n Crunch. The first ingredient in this is corn flour followed by sugar, rice bran oil, banana powder, palm oil, skim milk powder, artificial flavor, salt, lactose, egg white powder, and turmeric (no doubt for color). It's no shock that these are so sweet given that sugar is second on the list. They are surprisingly not so fattening. The entire bag (45 grams or about 1.5 oz.) is only 190 calories. For a salty treat, that's not bad. These are not bad really, but it is too sweet for my tastes. I was never a fan of banana chips in general, but I could see this really appealing to someone who loves them. Not only does it tastes like them, but these are more fun to eat due to the light texture. They're very close to being something I like, but ultimately, just too sweet to merit a "happy" rating. 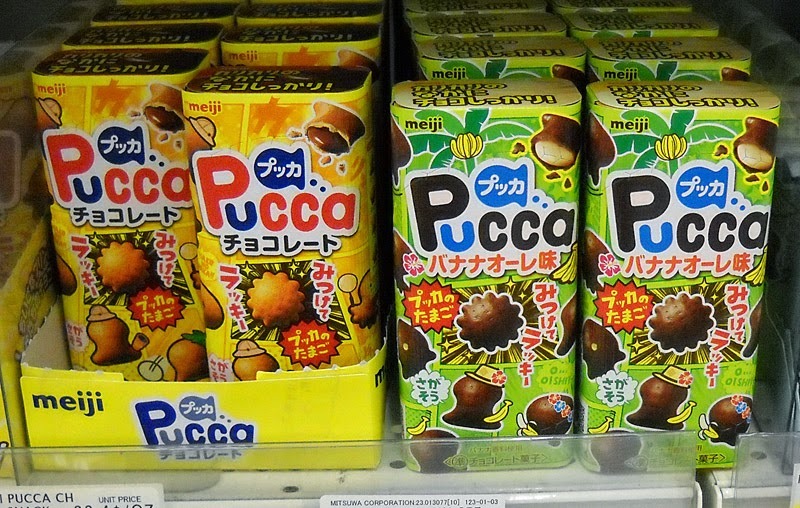 I'm a big fan of Pucca cookies/chocolate delivery system and I was happy to see a new flavor on the shelves. Unfortunately, the flavor on the right, which is the new one, is "banana au lait". I'm guessing the "au lait" means "milk". Infusing banana flavor into any sweet is risky as even real banana can come across as a chemical monstrosity through the magical alchemy of processing a food into a shelf stable substance. Since I really don't want to find a reason to dislike Pucca, I decided to pass on this one for the time being. Image from Nestle Japan's web site. 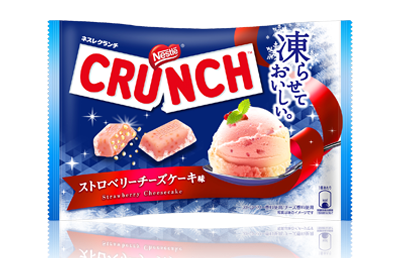 On June 9, Nestle Japan will release a strawberry cheesecake version of their Crunch bars. This is marginally more interesting than a similar type of KitKat, but only mainly because they haven't saturated the Crunch bar market with varied flavors as they have their darling KitKats. You may wonder why they're showing ice cream on the front of the package when this is a cheesecake flavor. In honor of the changing of the season from wet, humid, and uncomfortably warm to unbearably hot, humid, and somewhat less wet, they are advocating that you freeze the bars to give you a more pleasant experience. If you'd like to pick up a bag, they're retailing for 500 yen (about $5), but it's likely that you can get them for around 350 yen at most markets or discount snack shops. 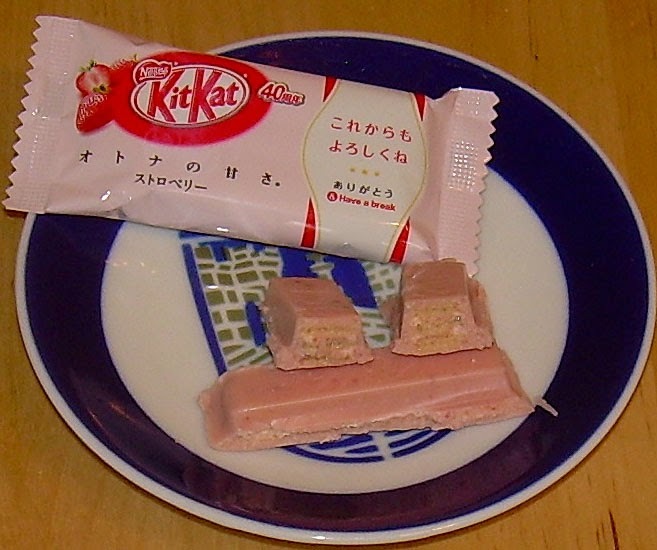 My guess is these will taste pretty much like the strawberry cheesecake KitKats. I'll pass, thank you. I have reached an important conclusion about the Fujiya brand's versions of chocolate. Well, it's not important in a global sense. It certainly isn't going to impact climate change, cure cancer, or end starvation. It's also not important in a local sense. It won't end the California drought or lower the local taxes. No, it's only important in helping my readers relate to the status of this particular brand in Japan relative to the status of a similar brand in the U.S. Saying it like that sort of undermines the sense of my conclusion having any importance at all, even in my estimation. Oh, well. At any rate, despite the less than earth-shattering nature of my revelation, I will finally offer it. Are you ready? Fujiya is the Hershey's of Japan. By that I mean that they make sub-standard chocolate products which are popular mainly because their taste is familiar, their packaging and logo can be related to, and their mascot a long-standing icon in the culture. Their products aren't great, but people know them so they like them. This is not exactly a criticism of Fujiya. I like Hershey's kisses despite their chalky texture and sour milk/yogurt-like flavor profile and less than endearing chocolate notes. You can enjoy something and recognize that it's not the greatest quality version of that item on the market. Bad pizza is a case in point. I love bad pizza because it is familiar to me as someone whose mother would purchase an enormous quantity of bread-like squares with some form of ketchup and vegetable-based cheese-like product on it. It was a fast food meal from our freezer that provided a welcome alternative to the disgusting sloppy mess of canned vegetables, stacks of day-old white bread, and meat stuffs cooked into a grey, tough mass that my mother used her very special culinary skills to create. Yes, I like things because they were introduced to me in my childhood when I had a very different frame of reference. The chocolates look cute with the adorable little embossed faces. 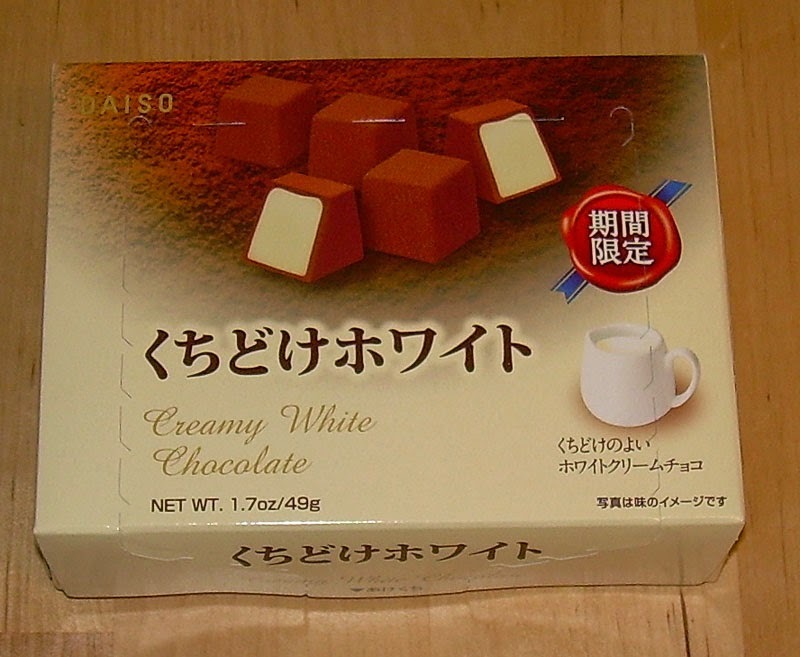 You may guess from that introduction that this box of twelve "Milky" mont blanc (a chestnut-paste-based dessert pictured on the lower right of the product's box) candies let me down. Indeed, it did. There is a particular flavoring in all of the Milky chocolates which I am not a fan of. I don't know what it is, but it is like the sour milk flavor in Hershey's chocolates. You either like it or you don't, and I don't. The bigger sin than this weird taste is that the chestnut/mont blanc component, which was the part of this candy which compelled me to buy it at Nijiya market for about $2.20 (224 yen), is quite weak. It tastes a little like caramel at first, but it dissipates too quickly to really detect any greater depth of flavor. Mostly, you're just getting the very soft, fatty weird chocolate exterior. I should note that this is not because it is fake chocolate, or at least I think it's not. 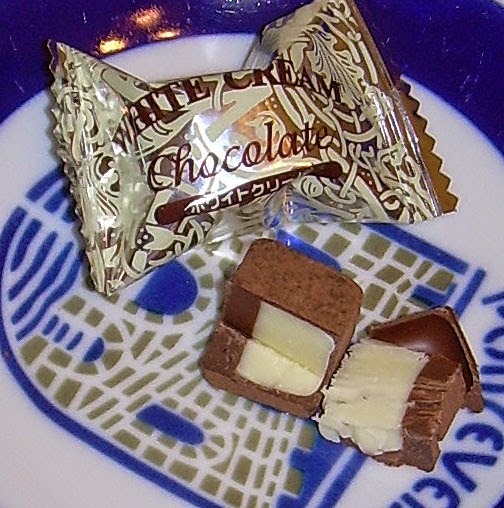 Fujiya uses cocoa butter and cacao mass. It also uses vegetable oil and "artificial flavor", which may account for the strange taste that I dislike. This is not horrible by any stretch of the imagination, but I'll turn to this when I'm out of other candy or want a tiny portion (each square is 20 calories) and only have big amounts on hand. I have to try to remember that I don't care much for Fujiya's products. I buy them so infrequently that I forget and make mistakes like buying this. That being said, the chestnut part would probably have sucked me into buying it even if I remembered Fujiya's freaky chocolate recipe. Besides, if I keep eating it, I may get used to it and actually learn to like it. It worked with Hershey's, after all. Nuts, corn flakes, bananas, wafers, rice puffs and crisps, potato chips, coffee beans, and grasshoppers. No, this is not a game of "one of these things is not like the other". These things are actually all alike in a particular way. All of them, including the grasshoppers, can be purchased in chocolate-covered fashion. I thought about all of the things which you can buy covered in chocolate which may or may not naturally seem a pairing with it when I pondered the idea of chocolate-covered gummy candy. Today's reviewable comes to you (and me) courtesy of CandyWarehouse at which you can not only buy the chocolate-covered gummy candy, but also a variety pack of insects enrobed in thick chocolatey goodness. The notion does bring to mind the "crunchy frog" sketch in Monty Python, but it may seem far less alien in the future than it does now as I hear that we may have to utilize insects for protein when civilization falls in the next 50 years or so. When that time comes, you'll think that chocolate-covered gummy will be a gourmet memory and in no way inferior to any of the other more common suspects. This isn't chocolate in the conventional sense as it's not the brown stuff, but rather fruit-flavored white chocolate. The three flavors are strawberry, muscat, and orange. The first and last seemed rather promising as those flavors pair well with conventional chocolate, but I was dubious of the muscat flavor. After opening the tube, I was hit with an intense fruity smell. It was surprisingly strong. After sampling each flavor, I discovered why. Each of them tastes like a child's bubblegum flavor infused into white chocolate. It is too intense and fake-tasting. The weird thing is that fruit juice concentrates as well as various fruit liquors are used to flavor these. The flavors come from real sources, but it's all a bit too intense for my tastes. Of the three, the one that was the least palatable was the muscat. I know muscat isn't the same as grapes, but they are similar. Chocolate-covered raisins work, but have you ever seen or tried a fresh grape as part of a chocolate fondue? I'm guessing not and for good reason. The two flavors just did not mesh. The strawberry was intense at first and ended with a strong white chocolate sweetness. It worked okay, but it was like two flavor blasts and neither was particularly tasty. On the bright side, the textural contrast of the soft, creamy chocolate and the chewy gummy was pleasant. Orange is the flavor that I would expect the most from, but it also was far too strong. It reminded me of flavor-blasted baby aspirin. I guess that all of that fruit flavor really is packed in there. I admire the effort put into these, and the truth is that my husband liked them. He said that the flavor really got more intense once all of the chocolate melted away, but he still liked it. I wouldn't say he loved it, and I don't think he'd go out of his way to get them again, but he will finish the tube. As for me though, I'm not going to eat more of them so that's an "unhappy" rating is for me and a "happy" one for him. He said he likes the taste and the overall experience are good for him, which is weird because he generally dislikes gummy candy of any sort. I actually like gummy candy and even have experience with chocolate-covered gummy (via Tirol's "mochi" chocolates which are actually gummy). So, the bottom line is that how you'll feel about this is going to vary based on your tastes. I'm going to give it the two ratings it deserves. When I was growing up, McDonald's had two ice cream options. You could have a shake or a pathetic little sundae made up of vanilla ice cream and some anemic chocolate sauce. Because I am not a fan of any fast food, and less of a fan of the golden arches than most other types of said cuisine, I hadn't really noticed the whole "McFlurry" business. I have a hazy recollection of when they were introduced and that they were either a collaboration with Dairy Queen or a rip-off of their "Blizzard" concept, but that's pretty much it. I've never had one in either Japan or America, but every nerve in my Spidey sense says they are probably pretty sweet. 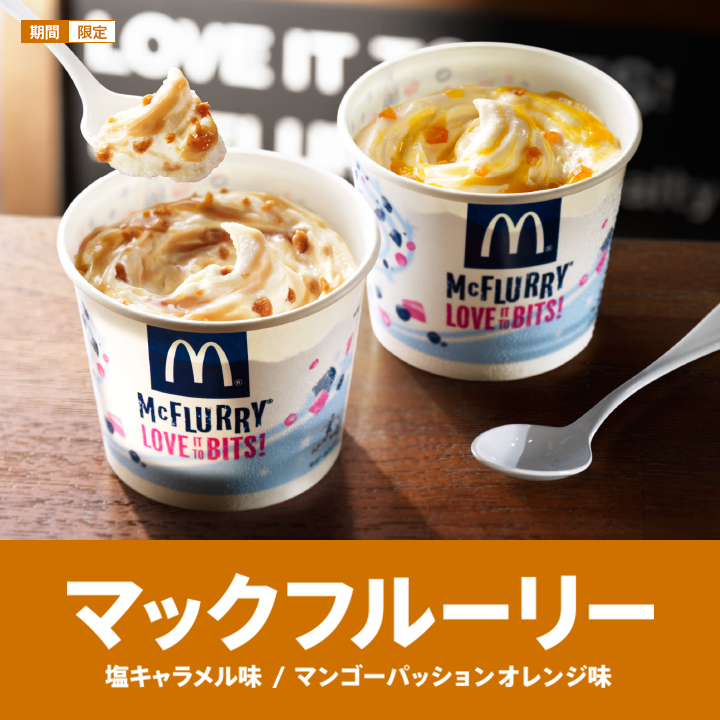 The specimens above are new McFlurry flavors - salt caramel (252 calories) and a mixture of mango, passion fruit and orange (230 calories). If someone were to force feed me one of these, I'd go for the fruity one, though I have to say that the salt caramel one could be intriguing. The funny thing about these is not the flavors. Though they are somewhat unusual, the whole salty sweets thing has been a big fad for years now (it was in force when I left in March 2012) and passion fruit is the only slightly uncommon element in the fruit one. The bizarre thing is that McDonald's plans to offer these only between 10:30 a.m. and 1:00 p.m. It strikes me as weird that they'd choose such a time period as it makes these seem more like "brunch" options than a sweet treat. Personally, I think offering them from 1:00-4:00 would have been a better choice, but I'm guessing this limit is based on the effort and time it takes to make them than when consumer demand might be highest. I hear the word "Oreo" several times a day every day. I wish I could say that was because I worked in an Oreo factory or even that I was employed creating new and bizarre flavors for them to put in their limited edition offerings. Unfortunately, it's because my neighbors in the building across the way got a little black dog with a white strip down its breast and they frequently are yelling at it by name, and the name they gave it is "Oreo". 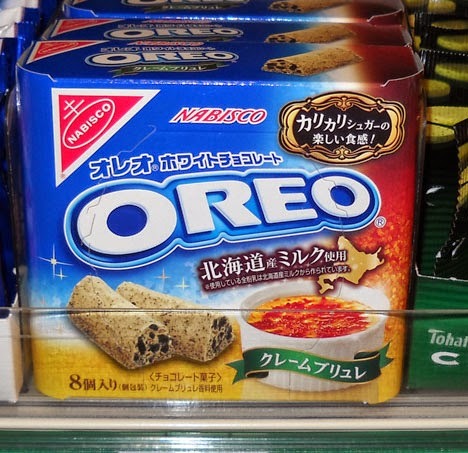 In Japan, they do not have a ton of strange Oreo cookie flavors. I'm stunned at how many Oreo cookies are in the regular rotation, let alone all of the seasonal and limited edition flavors like fruit punch, gingerbread, and rice krispies treat flavors. Instead of offering a ton of different cookies, Nabisco Japan has these cookie/candy logs that they offer in odd flavors. The one picture above next to what looks like a bowl of pizza toppings is "creme brulee". It's made with Hokkaido milk, just as I'm sure original French versions of creme brulee were made with that sort of extra special milk. 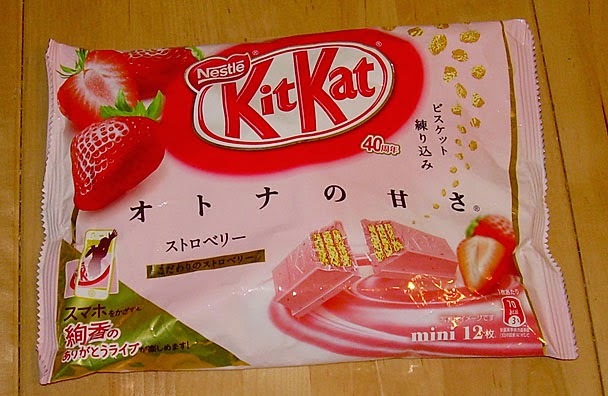 Nestle Japan is reissuing their raspberry flavor "adult sweetness" KitKat. I already reviewed this product when it was initially released. It is a pretty tasty variation and I'd recommend giving it a try if you're a fan of "framboise" or just like to try exotic KitKats in general. The packaging has been revamped and you can get it in two sizes, though both sizes contain mini bars. Candysan will be carrying both sizes for reasonable prices (it's currently out of stock, but I believe this reflects the fact that it is newly re-released and that they will have stock soon). I'm a little disappointed that this flavor is being reissued rather than a new one being introduced, but, as I said in yesterday's review, I'm not surprised. Nestle Japan has been taking an increasingly conservative approach to its KitKat line, and probably for good reason. I received today's item free from CandyWarehouse, which is actually pretty awesome... at least for me. My mother had a Japanese pen pal when she was in high school. I believe he lived in Hiroshima and at one point he sent her a Japanese doll in a glass case. I knew about this because there was a black and white picture of this man with his two children leaning against what looked like a fairly old-fashioned Japanese house in one of our photo albums for years. At that time, I didn't think much about Japan or this man. It would never have occurred to me that I'd ever visit Japan, let alone end up living there for most of my adult life. This pen pal stopped writing to my mother at one point and she told me he had been killed in an earthquake. I accepted this at face value for many years, but now I realize she simply made this up. She never heard any news of a major earthquake, but this was the explanation she chose to work with to explain why he got bored with or tired of writing to her. Unfortunately, making things up is something my mother did and continues to do habitually. Most of my mother's knowledge of Japan comes from her correspondence many moons ago (from the 1950's) when Japan was a very different place. Her notion of life there was (and may still be) frozen in what that pen pal told her. When I first arrived there and talked about the logistical complexity of getting myself, my husband and seven enormous pieces of luggage from the airport to our new apartment in 1989, her response was, "can't you just get a rickshaw?" Getting my mother to change her notions of what life in Japan was like 30-40 years after she corresponded with one of the natives was nearly impossible. People do tend to have difficulty abandoning a notion once they've settled upon it. One such notion that persists and I'm sure will continue to persist is the "crazy KitKat flavors" releases. Nestle appears to have stopped rapidly running a treadmill of releases of freaky flavors and settled on a new strategy. However, people still believe otherwise. The occasional odd flavor release as well as the existence of unusual regional flavors (which are available year-round) will reinforce such notions, but the truth is that things have changed a lot. The marketing has skewed to reflect changes in the demographics in Japan. There are more older people and fewer younger people. Japanese people have endured a long period of relative economic decline and take comfort in more old-fashioned and conservative flavors. The days of ginger ale, apple, cola, and lemon squash KitKats are likely over. It's not that we'll never see another weird flavor again, but just that the extremes are less likely and less frequent. As a point of comparison, I will say that, at its height, such strange flavor releases appeared to hit the convenience stores every 2-3 months. The core line-up of KitKats these days strongly reflects the conservatism of the company's choices now. 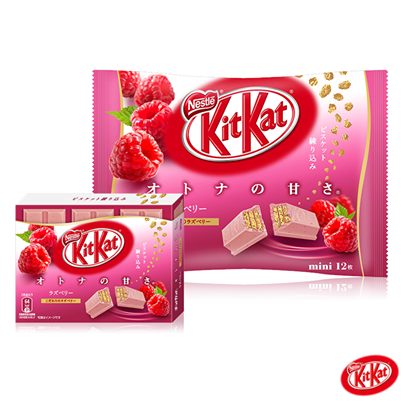 Their main releases are the plain chocolate KitKat and various similar big bars and the "adult sweetness" line-up which includes bittersweet chocolate, milk/vanilla, green tea, and strawberry with a very occasional new flavor (like passionfruit or raspberry). Mostly, these are available as individually wrapped mini bars either in boxes or bags. The whole position of these KitKats is that they are less sweet to cater to adult tastes since kids tend to like things much sweeter than grown-ups. The size is also meant to cater to the smaller adult appetite for treats. Of these "adult sweetness" options, the only ones that I had not already tried were passionfruit and strawberry. Fortunately, CandyWarehouse offered me the opportunity to sample the strawberry without having to fork over a pile of cash to buy a bag at a Japanese market. Generally, it costs $6-$7 to buy them locally. They are, obviously, much cheaper in Japan as compared to buying them as an import. The bar is a little soft on the outside, which is often the case with white chocolate, but the inside has nicely crispy and super fresh-tasting wafers. The chocolate lives up to the claim of reduced sweetness and lacks the cloying and weird artificial notes that white chocolate blends sometimes possess. The strawberry flavor is nicely blended in and neither too potent nor too weak. It's exceptionally balanced in terms of giving just enough sweetness to be a good experience, but not so much as to be overpowering. There is good flavor depth - you can detect the white chocolate, the strawberry, the sugar, and the wafers - and good textural variation with the wafers crispness and the creaminess of the white chocolate. The entire adult sweetness line is a winner and this surprised me because I'm not a fan of either white chocolate or strawberry chocolate, but the balance on this is perfect. I could definitely see having this again and will be quite pleased to finish the bag. I wish Nestle would provide a similar line for the American market, but I'm guessing that the "all or nothing" nature of American tastes - that is, either eschewing sweets altogether or wanting them to put you into sugar shock - would make them too unpopular to survive here. This is a fresh and pleasant way to get your sweet on, and at only 70 calories per bar, a nicely portioned treat. When I lived in Japan and needed or wanted something which was difficult or troublesome to obtain at brick and mortar shops, I'd do what we are all inclined to do in this modern age - I'd go online and search. My first stop was always Amazon Japan because they offered free shipping, delivered fast, and usually had the best prices. The problem was that they didn't always have what I was looking for. 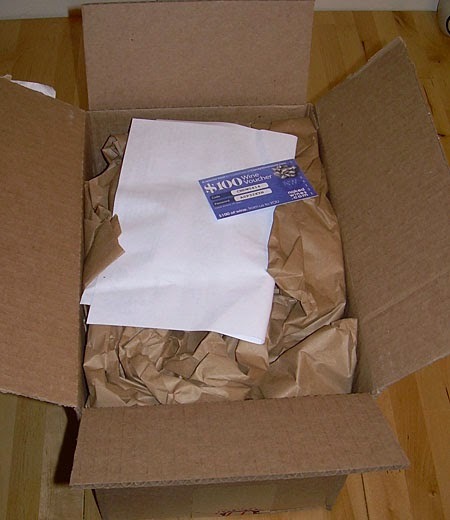 In fact, one of the little challenges of being a foreigner with foreign needs and tastes was that domestic mail order places like Rakuten, Amazon Japan, and even the FBC (Foreign Buyer's Club) frequently did not offer what I was looking for. It was not unusual for me to search online and discover that there was a place that sold what I wanted at a great price, but that outlet only shipped within the United States. Sigh. It was like dangling a carrot in front of a hungry horse that was restrained in a stall in its stable. Yes, it's there, but you can't get to it. On occasion, I'd get a hankering for some nostalgic snack or food. Not only that, but I'd talk about food experiences and want to share them with my students. One of my favorites when I was growing up in Pennsylvania was Mallo Cups. They are far too sweet for the Japanese market, which only likes things super sweet when they're talking about pressed sugar sweets to be consumed with green tea, it seems, so, clearly, I'd never find them in Japan even in import shops. Even when my husband went home to visit his family in California, my desire for this old-fashioned treat could not be satisfied as they are both regional and retro. The shops he tended to visit didn't have them. The only way to get them was to buy a case from an online vendor with a large repertoire, such as the subject of today's post, CandyWarehouse. Since I live in an area with copious numbers of Asian markets, I haven't had to turn to mail order places in order to secure reviewables. However, I am well aware that many of my readers are far less geographically fortunate than I am. When I was contacted by a representative of CandyWarehouse and offered a chance to experience their service, I took it. I did so utterly altruistically in order to tell my readers about their service and was in no way influenced by the prospect of free candy. No, I'm quite the humanitarian and labor only for the benefit of my kind and loyal readers. 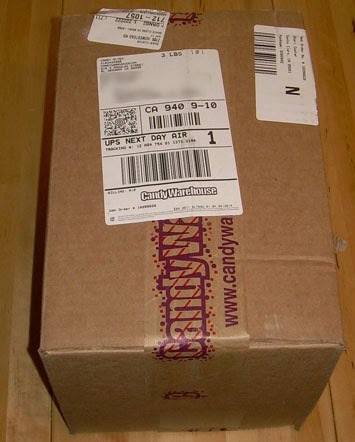 Today, I'm going to review CandyWarehouse's service and I will review the two products that they sent me next week. In terms of their service, I have to say that they are utter professionals in every way. My order arrived in two days and on the hottest day of the year so far. In fact, I was worried after having made an order that included chocolate that it'd arrive in an amorphous blob. Fortunately, a free ice pack had been included and the candy arrived in good condition despite the high temperature outside of 97 degrees F. (35.6 degrees C.). You can see by the unboxing pictures that everything was very well-packed. There was proper documentation in case of a mix-up with the order and it was well cushioned by copious amounts of paper padding. Frankly, I prefer paper to those air bag things which are so common these days, though I understand that the bags are lighter and lower shipping costs. This preference is no doubt informed by an experience I had in which my sister sent me some porcelain canisters and padded them tightly with air bags. I received a box of shards and flattened plastic bags. My faith in them is not particularly high. 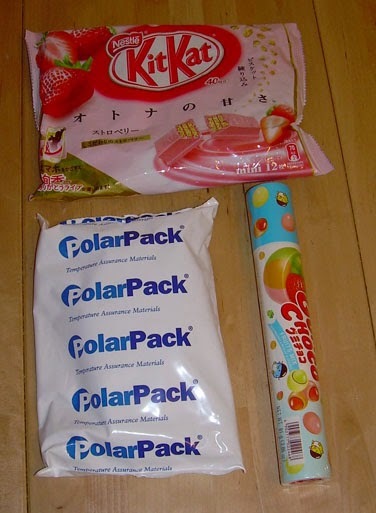 I should note that CandyWarehouse is the only place that will offer you free cold packs (with expedited shipping), so, if you order chocolate in the summer, they're your only option to insure that your chocolates won't melt among the limited number of places that offer Japanese snacks. Since they operate from within the U.S., they also offer the fastest shipping to customers inside the U.S. Their nearest competitors use SAL (sea-air-land) to send snacks from Japan. This rate usually takes about two weeks whereas CandyWarehouse offers a range of services with the longest being about one week. If you want to get something fast and especially to keep it cold, they are the only option that I know of. I'm going to review the two food items that I received next Monday and Friday, so you can look forward to hearing about them then. Image from Mosdo - click this image to see a larger one with more detail. I'm a fan of balancing things out when I eat, but some people really like to stay with the same theme. For me, if I have pizza, I want to have a salad on the side as a way of balancing the nutrition. I don't like to have, say, fried cheese sticks. Cheese plus cheese is not my thing. I'm not criticizing those who enjoy such pairings, but, simply saying that they are not for me. If you are someone who likes to layer on the fatty food all together, then the happy marriage of Mos Burger and Mister Donut has something you might like. 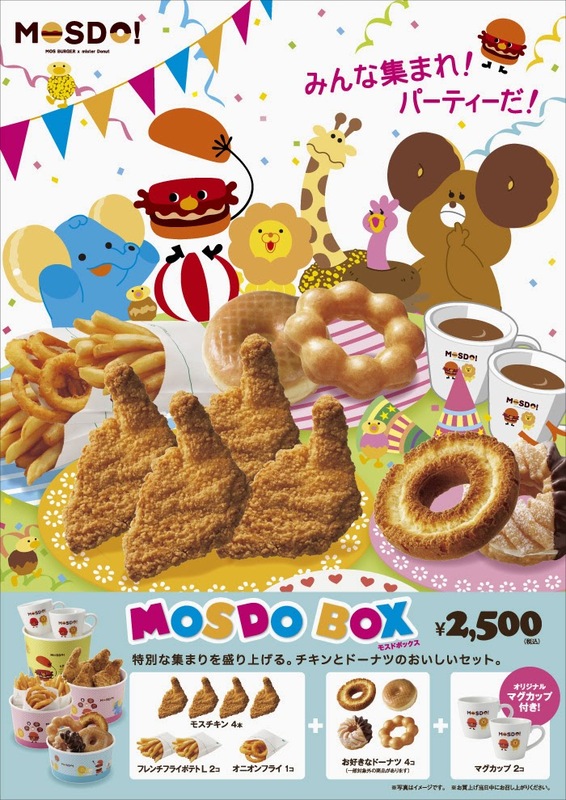 For a 2,500 yen (about $25), you can get 4 pieces of Mos chicken (breaded and deep-fired, onion rings and French fires plus 4 donuts and a couple of Mosdo mugs for your coffee. I suggest you make that coffee black and let that be the only thing you drink the next day after chowing down on this fat fest. Recently, I was talking about Asian bakeries with my sister-in-law. We were talking mainly about a chain called "Paris Baguette" which has a French-sounding name, but is actually Asian and has a focus on Japanese- and Korean-style offerings. Of course, when I talk about baking and Japan, I really mean the European-style confections that Japan has modified for its market's tastes. One of the things which Japan modified for its tastes was flan, or, if you prefer, pudding, or, even "creme brulee" without the burnt top. I've always been confused about whether this should be called one or the other. As you can see by the side view, this is essentially flan. It has a sweet syrup on the bottom and a thick pudding in the center. Personally, the point at which flan and pudding are separated comes at how thick they are. Flan can stand on its own, though it may wobble a bit. Pudding tends to be a bit more gooey and needs a container to support it. 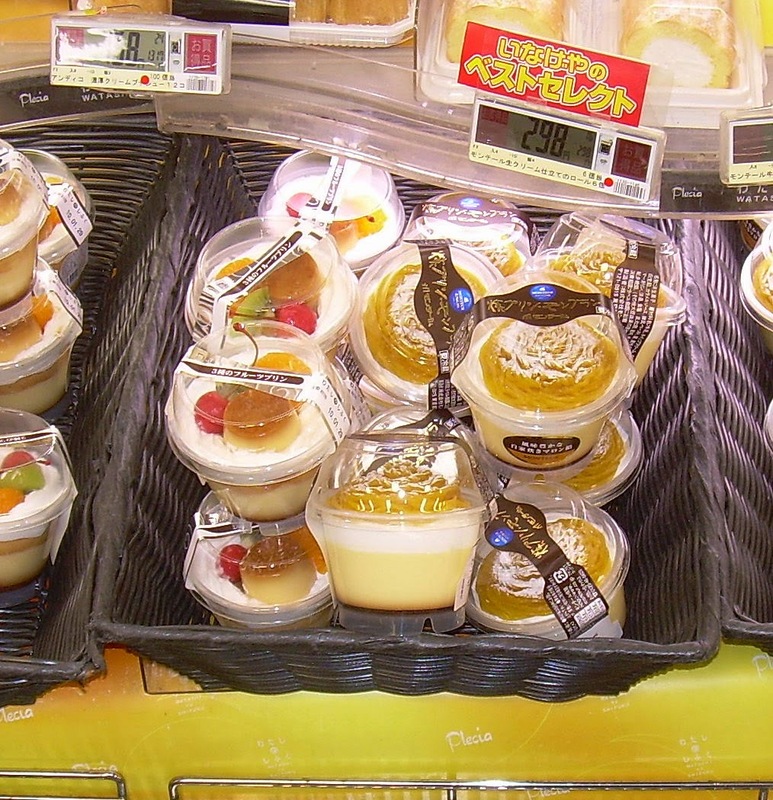 At any rate, the plastic containers of "purin" that you see here were in a supermarket in Tokyo and they have whipped cream as well as chestnut puree (the ones on the right). The ones on the left are "fruit purin", but the curious thing about them is that they have a mini purin on top of the larger purin. It feels like one of those mirror within a mirror deals, only with food. I can get my hands on no small amount of Japanese snack food. In fact, I could fill this blog with daily reviews if I wanted to and never run out of options just based on what can be had locally. However, that would be problematic because I'd have to eat an entire package of food or toss a lot of stuff out (not to mention that it'd be expensive), so you get two reviews a week and news pieces like this. One of the things that I haven't seen available, however, is the line of super spicy Tyrant Habanero salted snack rings. In Japan, I loved these things. They are super hot, and I'd have to be careful not to eat too many (because, as one of my web acquaintances remarked, they taste good going in, but aren't such a great experience coming out), but I really had a thing for them. I tried some of their other products with mixed results, but the rings never let me down. Tohato has released a line of these spicy rings coupled with the creamy flavors of avocado. As you can see by the pepper scale on their ad above, this is a three out of five, so not as hot as their usual fare. I would be all over trying this is I could get my hands on it. If you're interested in a little Tyrant Habanero fun, you can play a Space-Invaders-style game here. You don't need to understand the Japanese. You just click to choose your ship style when the option comes up (and click "skip" on the intro since you can't read it anyway). You can also download some, frankly, pretty ugly wallpapers if you're so inclined. Those can be had here. Note that the top ones are movies. The bottom ones are images that you can download. 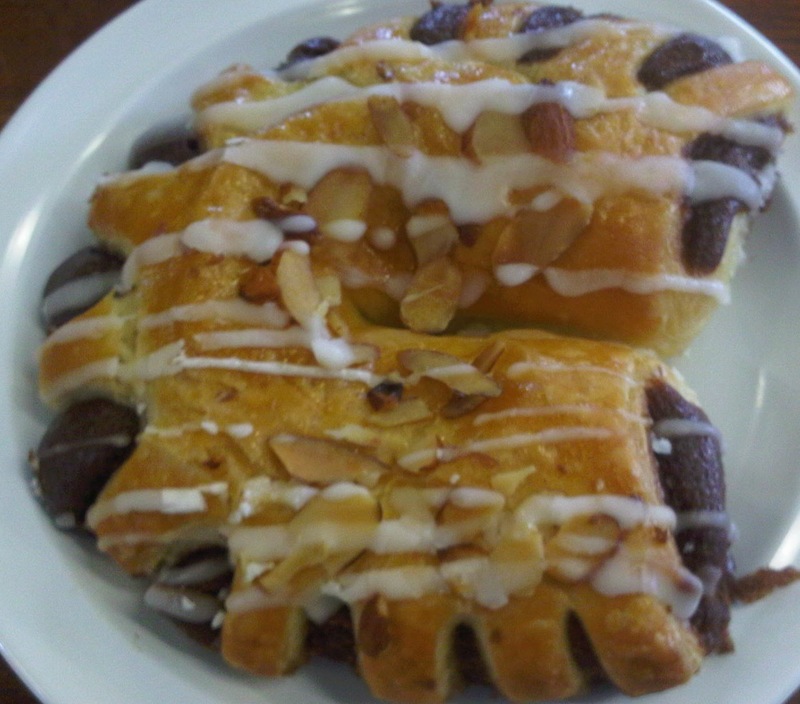 Since returning to the U.S., I have seen a pastry called a "bear claw/paw" many times. I've never actually consumed one, because they are huge and have almonds and my husband doesn't eat nuts and I don't want to be responsible for the full calorie load on my own. The reason that I've seen so many of them is that my husband has a fondness for donuts so I've seen a lot of different donut shops and their various takes on the "bear paw". Sometimes, these specimens actually resemble the paws and claws of a bear in their shape and they definitely have verisimilitude when it comes to size. At others, it's just a rectangular dough concoction which someone has haphazardly snipped the edges of in a weak attempt to make it look like it could be a paw in an abstract or cubist representation. In other cases, it's just an almond pastry that is square or rectangular and has the same components as the traditional bear paw, but doesn't look like one at all. In one case, it looks like a bear paw only if your bear is a mutant with a lot more toes than usual. The idea of how foods drift in appearance from the name they have been given was brought to mind because "langue du chat" means "cat's tongue". The original is a long, stretched shape with has two somewhat spoon-shaped ends. Though this is called "langue du chat", you'd have to have a pretty weird cat to have a tongue shaped like these nearly perfectly round little cookies. Clearly, like the bear paw, the composition appears to be the reason for the name. That being said, I've read that it's supposed to be a chocolate, not a cookie, but then I never encountered the name at all until I moved to Japan. There, langue du chat tends to refer to two crispy butter-cookie-like wafers with a modest amount of sweet chocolate filling some sort. These cookies definitely fit the description in terms of content, if not in appearance, of the langue du chat that I experienced in Japan. A quick whiff reveals a pretty potent strawberry chocolate smell. The first sensation is largely textural rather than about flavor. The outside cookie, rather disappointingly, doesn't have much flavor at all. It does have a slightly melt-in-your-mouth and somewhat crispy at the same time texture. Most of the flavor comes from the rather sweet strawberry filling, but there is little enough filling that you don't get overwhelmed by the sweetness. The punchy strawberry flavor that is carried by the acids in them doesn't come through until you have a second cookie, which at 12.5 calories per cookie, you can certainly justify doing. I paid a dollar for these at Marukai Japanese market and I find myself torn about how I regard them. 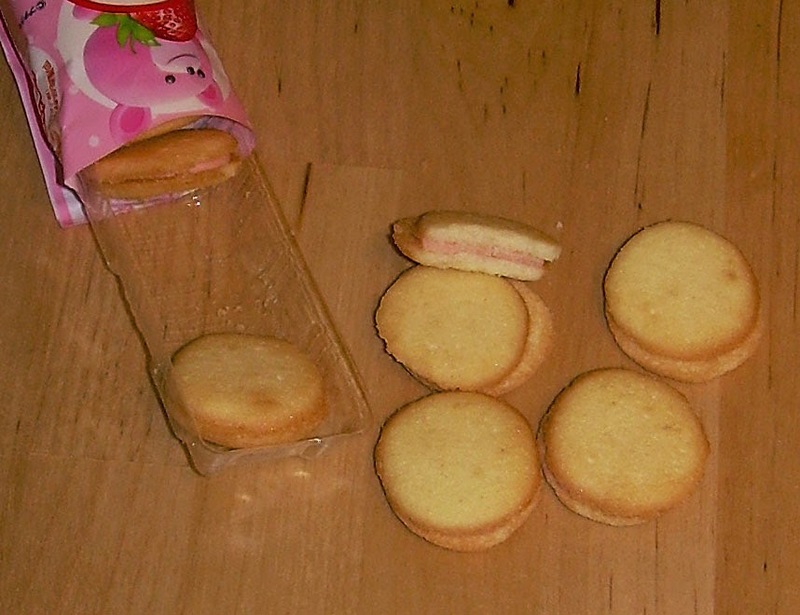 They are certainly decent little cookies. The texture of the cookie itself is excellent, but I also wish it carried some margarine or flour flavor to create greater depth. I'm absolutely in low with the texture and the tiny size (each is about the size of your thumbnail), but I'm not an enormous fan of strawberry. The bottom line is that I'm happy that I bought these, but I don't think I'd get them again. I am inspired to try a chocolate version in the future. Because of that, I'll settle on a "happy" rating rather than "indifferent". Most Americans grew up knowing the difference between Coca-Cola, RC Cola, and a store brand cola. We know that the store brand is a knock-off of Coca-cola and that it will be much cheaper, but inferior in taste and likely mouth feel (because of a variation in carbonation). RC Cola wasn't as bad as the store brand, but still a big step down from "the Real Thing" (aka Coke). When you encounter brands from another country, you have little idea what is what. The big cheeses will eventually reveal themselves if you pay attention, and the lesser brands may or may not build their way into your brand awareness consciousness. 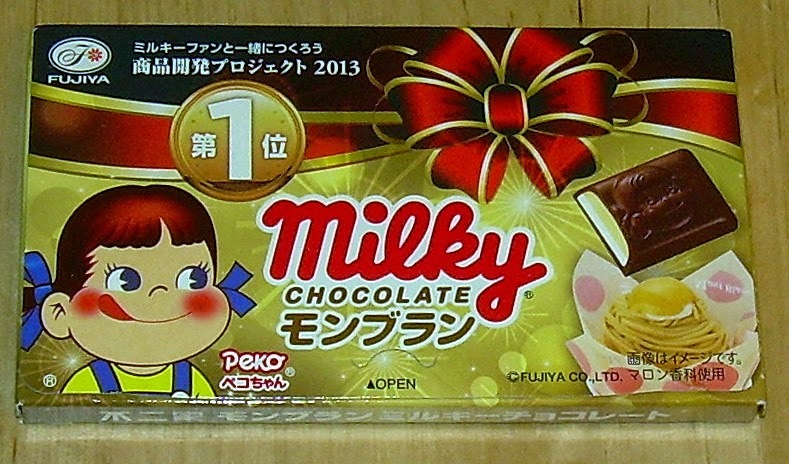 Glico (Pocky), Lotte (Koala's March and Crunky), and Meiji (Hi-Chew and Meltykiss/Meltyblend) emerge as the premium consumer-grade snack makers. Meito, the manufacturer behind today's item, is definitely closer to the RC Cola level than the Coca-cola level. In fact, they're just a few steps up from store brand. Rather ironically, Meito created this chocolate as a store brand item for Daiso. For those who don't know, Daiso is a 100-yen shop in Japan and has branches in the U.S. at which it typically sells items for $1.50. It is an awesome store in Japan with a lot of utilitarian and cool items. In the U.S., it's still pretty great, but the selection isn't nearly as good. This product is clearly designed to have the look and feel of Meltykiss/Meltyblend chocolates. 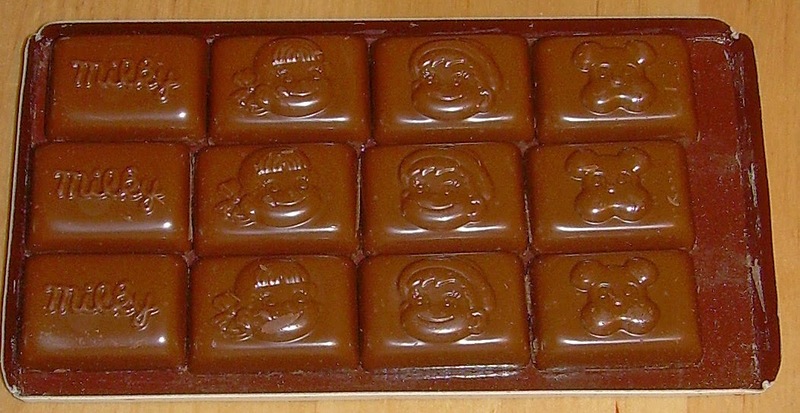 The packaging is similar as is the square-shaped chocolate in individual foil packets. 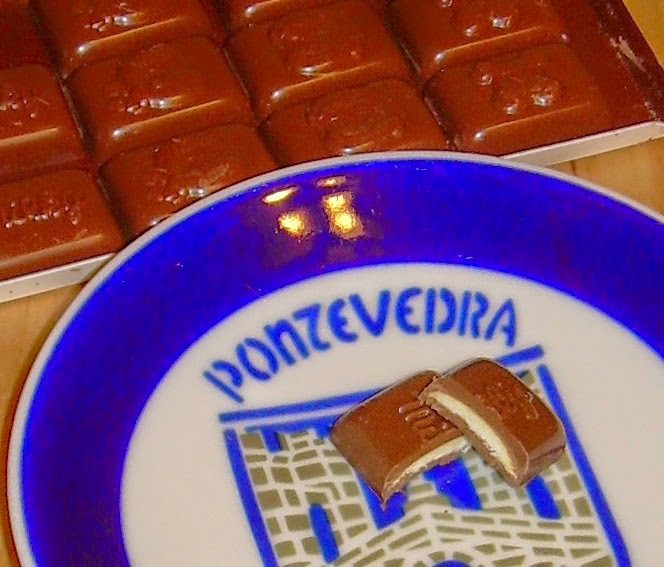 Both are also dusted with cocoa powder on the outside and meant to resemble truffle-like chocolates. The main difference aesthetically is that the cocoa powder on the outside of these is much lighter in color than Meiji's Meltykiss. 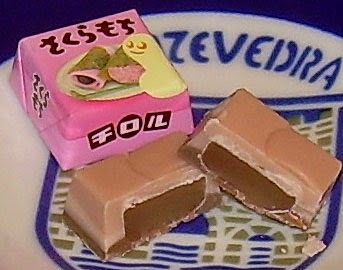 The use of "kuchidoke" or "melt in your mouth" is also meant to evoke the image of the more popular brand name product. Meltykiss is only sold in the winter because it's supposed to, well, "melt". The first thing I noticed about this was that it was harder than a Meltykiss chocolate. The outer coating seemed more like a crisp shell dusted with cocoa powder that surrounded a core of plain white chocolate than the ganache/truffle-style experience of the competitor it seeks to emulate. I could tell by how hard it was to cut through and how the outer shell shattered that it was definitely not the same as a ganache or soft truffle chocolate. It does melt in your mouth, but not as a soft, yielding, fatty chocolate. It melts in the way that nearly any kind of chocolate would do so if you held it on your tongue long enough. The flavor is actually quite good with a deep flavor of chocolate hitting you after it melts on your tongue for a moment. That is, I imagine, the outer coating melting away and the effect of the cocoa powder. The second flavor is less impressive and that's the white chocolate coming through. For at least a short time, it let's loose some cheap white chocolate flavor before it yields to a richer, creamier flavor. All in all, it's fine, but a mixed bag and certainly not on par with Meltykiss/Meltyblend in terms of quality. There is absolutely nothing "wrong" with this chocolate taken on its own except for the fact that it doesn't live up to its promise either as a knock-off of Meltykiss or as a "melt in your mouth" experience. Given that Meltykiss in the U.S. costs $4.00 (usually) and this is $1.50, it may be unrealistic to expect better for such a low price. However, you can spend your money on something domestic which will be just as good if not better. Though I enjoyed these on a certain level, I definitely wouldn't buy them again and am not inspired to try the other varieties in the Daiso line - at least not at this time. When I was 19 years old, I decided to stop eating beef and pork. That put a whole world of food out of my reach because, back in those days, most people didn't eat chicken unless they were too poor for beef or it came fried in a bucket and turkey as a mainstay of regular eating hadn't yet become a part of the American food culture. I know this because I listened to my 22-year-old self on an ancient tape (1987) tell my future husband (then merely a pen pal) about turkey burgers. He had no experience with those tubes of ground turkey that I was then using as a way of substituting for cheeseburgers. I recall very well that they were not only lower in calories and tastier (at least in my estimation), but also much cheaper. Oh, how things have changed... these days, if it is leaner, healthier, and better for you, it is more expensive. Taste no longer rules the roost when it comes to cost. The prices of avocados are going up due to drought and I guess random needs to charge more for sources of healthy fat and highly nutritious food. I don't know if avocados were cheap 27 years ago, but I'm betting they weren't nearly as popular nor as valued. All I know is that they are now $2 each when they were a dollar each or less two years ago. In light of this, it seems odd that McDonald's is offering avocado burgers. Of course, I believe those generous chunks of avocado as seen on the picture above are a big, fat lie, but they'll have to make it noticeable if they're going to live up to the name. There are three choices of burger: beef with bacon, onion, cheddar and wasabi; fried chicken with cheddar cheese and what they call a "Cobb salad" sauce which includes coriander, chili and black pepper; a fried shrimp patty with the same Cobb salad sauce (no cheese). Each burger comes on a ciabatta roll which I'm sure will be as fresh and tasty as if it had come from an Italian bakery. Image courtesy of KFC Japan. Click to load a larger version. May 5 was "children's day" in Japan. It is one of the holidays celebrated during "Golden Week" in Japan. 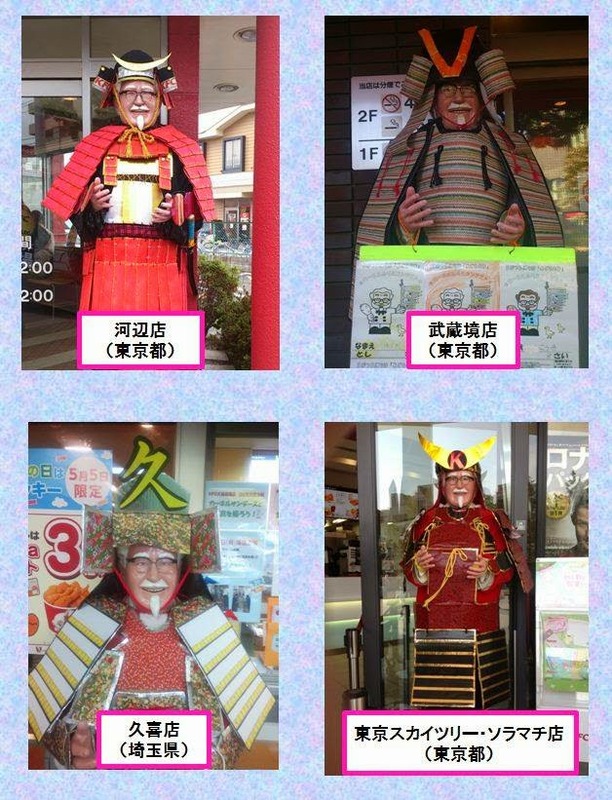 As part of the celebration, KFC Japan dressed the Colonel statues in warrior garb at various locations. Given the range of costumes that I have seen on the statue, I have to wonder if there is a storage room in every branch which houses his wardrobe or if these things are rented for the day and then sent back. Between Santa and witches costumes and traditional Japanese holidays, old Colonel Saunders has a bigger wardrobe than I do. Incidentally, if you have a thing for old Southern Colonels and you'd like to put one on your desktop, KFC has a couple of pictures you can make your computer background. You can get them here. Friends, Romans, countrymen, and anyone from any country other than Italy or America who reads my blog, I am here today to talk about corn. Yes, I have spoken many times about how corn is the king of all grains and I will speak of it again as long as you don't start posting comments about how you're sick of me talking about corn and will quit reading if I keep up this nonsense. One of the many things I learned from life in Japan (and I've learned so much, including the fact that mayonnaise is considered its own food group with a minimum daily allowance in said country) was that we view corn in far too limited a fashion in the U.S. Sure, we have cornmeal, muffins, cakes, etc., but we have no yet released a candy that is corn flavored. The furthest that we are willing to go is to cram cornflakes in our sweets... and, for some reason, the sushi at Safeway supermarket also has cornflakes but that's a life mystery for another time to explore. Today, we're talking about the under-utilization of corn. When I saw this corn candy at Nijiya market for a mere $2.19 (I'm sure it sells for about half that in Japan, but, imports, go figure), I knew that I would have to buy it because this was the sort of "only in Japan" thing that people need to be aware of. Sure, they think "only in Japan" applies to men cuddling pillows shaped like women's laps and muttering "moe" under their breath in contentment or that people are eating burgers made from the ground flesh of beef that drank nothing but beer and had their torsos massaged daily by cherubic children in school uniforms. The real "only in Japan" is far more mundane than that, at least in my opinion. It's the funk that isn't funky enough for the blogs to cover, and it includes (but is certainly not limited to) how they more fully embrace corn. Sure, we know they put it on their pizza and sell it with their pizza (so that you can put mayo on it and eat it as your "vegetable" side dish), but they also drink it in soup for breakfast and, they put it in their candy. They put it in 22-calorie morsels of taffy-like candy that are marketed as "big balls". I opened a wrapper and gave the candy a sniff. It doesn't smell like anything. When you put it in your mouth, it is a little on the hard side and you have to warm it up and chew it to release the flavor. 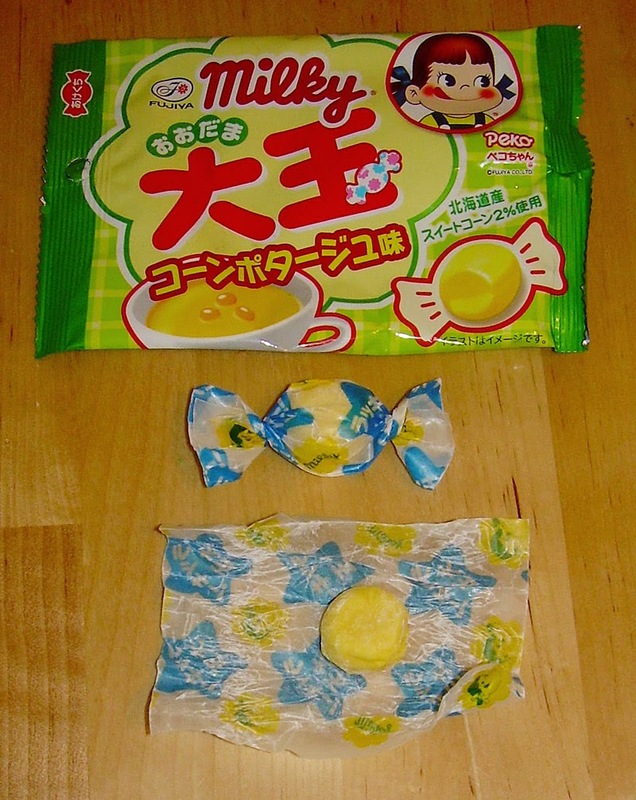 As it softens into a chewing gum-like taffy, it starts to melt in your mouth and release strong sweet-corn flavor which is amplified by the corn syrup (which is the first ingredient). It is also infused with richness and even more sweetness from sweetened condensed milk. In the end, it is potently sweet and has strong corn flavor. This is not necessarily a bad thing, but this is a pretty intense flavor experience both on the sweetness and corn front. I liked this quite a lot, to be honest. I love corn flavored things and corn potage soup in particular. Lately, I've also taken to making polenta and eating it with pancake syrup and butter (as well as in savory preparations). When I make corn tea, I even sweeten it to bring out an essence which is similar to this (and corn tea is naturally sweet). Corn and sugar are in a good relationship as far as I'm concerned. That being said, I would not say this is for everyone. For some people, corn is associated with more savory options and they think of it as something slathered with butter and sprinkled with salt - either at a movie theater or a backyard barbecue. Depending on your tastes, this could be manna from heaven or a horrendous blob of sugary awfulness. All I can say is that, this is what "candy corn" should be rather than the horrible stuff we see every Halloween. If candy corn tasted like this corn candy, (at least some) people might actually be happy to eat it. You probably don't know this, but the packaging on this candy is attempting to pander to different regional audiences. You also probably don't care, but it's my job to, as the tag line says, "tell you more than you need to know about Japanese junk food." It's not just my blog's motto. It's my lifestyle. Let's start with what sakuramochi is. It's a Japanese sweet which has red bean paste in the middle and is surrounded in some fashion by rice cake - not the sort of rice cake that Quaker sells in stores which looks like popcorn that has been fused together in some sort of horrible industrial accident and tastes like Styrofoam packing peanuts. No, no. 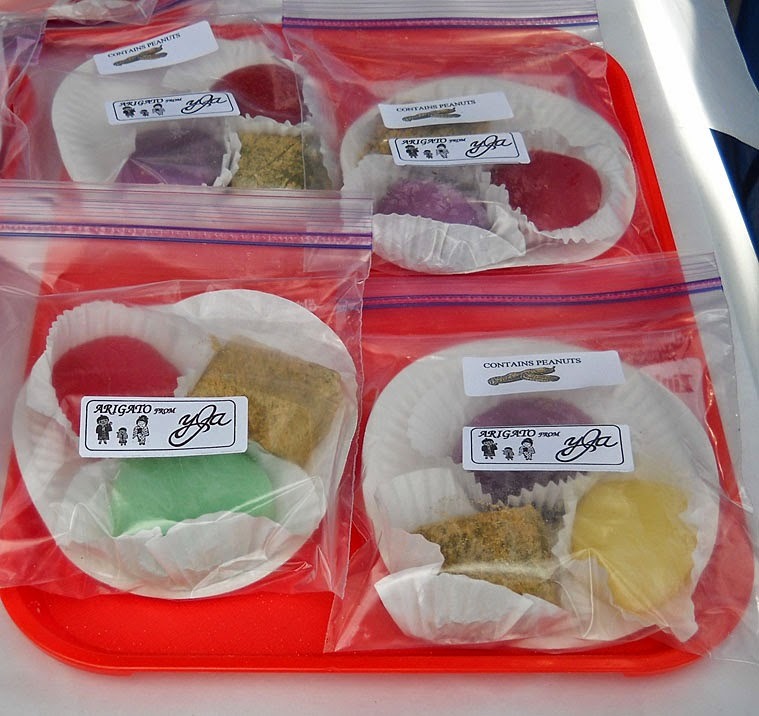 This is Japanese stuff, mochi, which is rice pounded into a stretchy, somewhat taffy-like substance which people can more easily choke to death on (especially old folks). 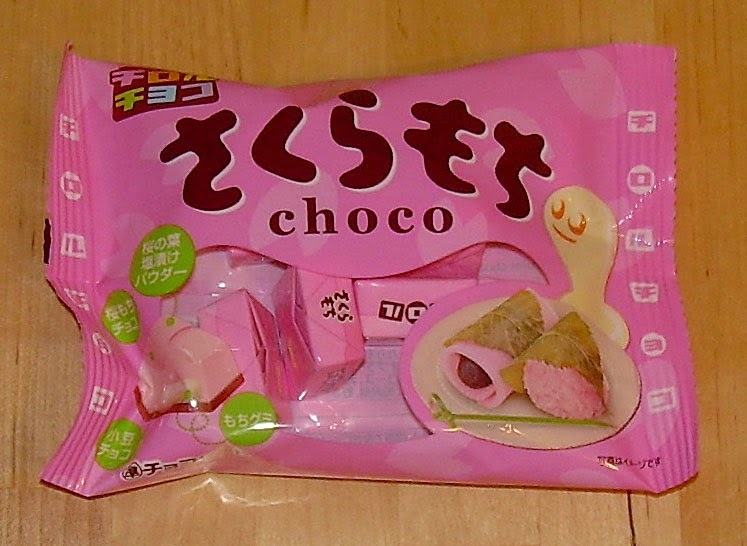 At any rate, there are two styles of sakuramochi pictured on the lower right of the package. The rolled up one with what looks like a bit of a turd poking out (such elegant prose from my keyboard) is Tokyo- or Kanto-style. The kind that looks like an innocent pink blob of fuzz is Kansai-style. Each has a sakura leaf wrapped around it. Mainly, they have textural and aesthetic differences, or at least I think that is the case because the truth is that I never ate sakuramochi in Japan. I ate plenty of wagashi (Japanese sweets) and lots of mochi and red bean stuff, but never that particular type. So, I'm not going to be checking this candy for verisimilitude to the real thing. I'm guessing that is actually for the best. This is, obviously, one of the spring releases from Tirol. Well, it's obvious to me because spring is when everything "sakura" pops out of the marketing woodwork in Japan. It's all green tea and sakura now, with great lashings of strawberry thrown in for good measure. It's a thing in Japan. It's similar to how pumpkin flavored everything starts flooding the market in July in anticipation of Halloween in October and how it sticks around until March of the following year because they can't possibly sell a million products in pumpkin flavor in the span of time that encompasses the winter holidays. At any rate, I didn't know exactly what flavor to expect from this, but the smell caught me by surprise. When I gave it a good whiff, it smelled distinctly of red beans. There really wasn't much else to smell. 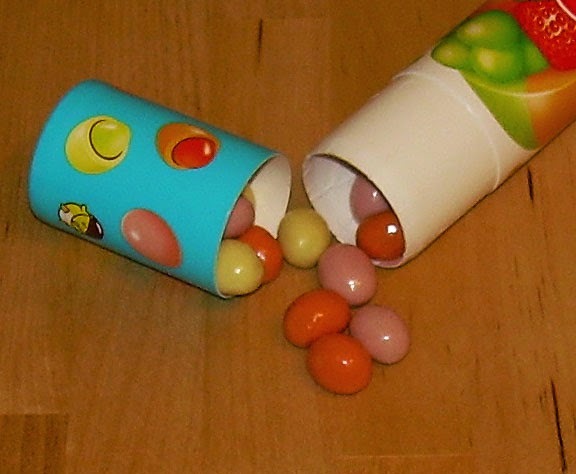 The first bite into the candy yielded a moderate amount of red beans with some flowery sakura flavor. As I chewed into the little gummy center, the bean flavor asserted itself much more strongly. It tapered off and revealed a fairly sweet taste at the finish that developed the sakura flavor a bit more and made it border on, but not cross over the line into being "perfumey". The final taste left in my mouth was a mixture of both the red bean and sakura. For a tiny little candy (33 calories, about the volume of a Hershey's kiss), this packs some complexity both in terms of flavors and textures. The chocolate part on the outside is soft and yielding. The gummy is quite chewy, bordering on a little bit too hard to bite into. There are earthy, sweet, and perfume-like elements, but you have to either eat slowly and pay attention or eat more than one to really pick up on the multiple subtle flavors. This is not the sort of candy that you eat to stuff your pie-hole with sweeties. It's the sort of thing you eat for a unique experience. You pair it with tea, one little package next to your cup, and take the tiniest bite possible and try to discern the mysteries in your mouth. Take a drink of tea and give it another go. Repeat until you're done. This is a good candy in a way, and a less good candy in another. It's one of those things which you would never find in the U.S. because it's complex and not necessarily easily accessible by most palates. This doesn't make it a bad thing at all, but it does make it something that you absolutely have to either already have a taste for or be in the mood for. I'm glad I bought this, especially at the relatively modest price of $2.19 at Nijiya Japanese market (for an eight-piece bag). However, I would not buy another. Once is enough. One of the customs that is popular in the U.S. is for people, mostly men, to come together and watch sports while ingesting large quantities of nutritionally suspect food and intoxicating beverages. In Japan, this is done as well, but generally not in people's homes. The idea of what they often refer to as a "home party" (a get-together with friends that usually involves food and drink) is still a little alien to them since Japanese folks take entertaining and hostessing much more seriously than Americans do. At any rate, this offer from Pizza Hut seems designed to help encourage people, mostly men, to eat junk food and watch sports. In this case, the sport would be soccer, or, as the non-Americans call it, football. For 2,680 yen (about $26 U.S.), you get a split pizza with your choice of four possibilities: margherita, teriyaki, avocado and shrimp, or meat (Iberico ham, bacon, sausage). You also get several side dishes including corn, chicken wings or tiny drumsticks, and roast potato wedges. As someone who bought a Pizza Hut pizza, I recommend the "paku chiki" or spicy chicken drumsticks as well as the potato wedges. 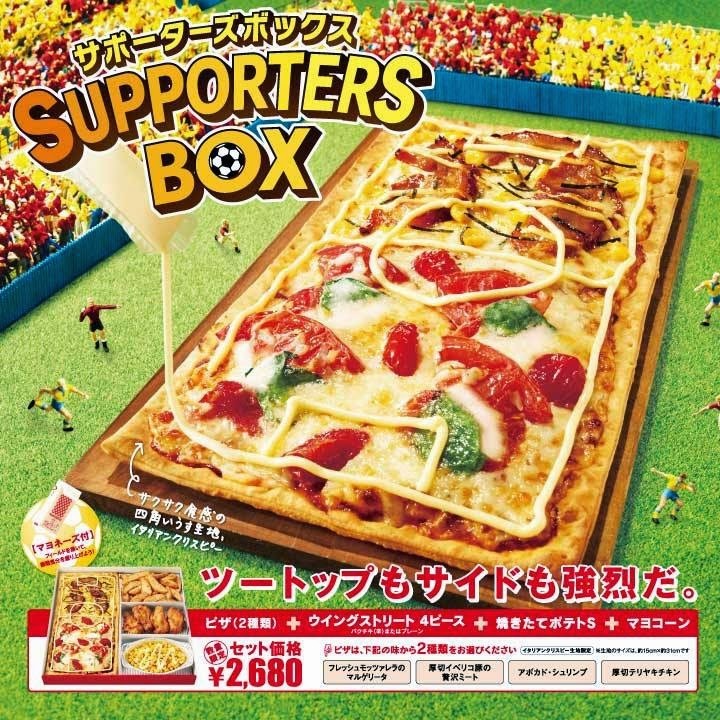 As an addition, they will also give you a small packet of mayonnaise to draw a soccer pitch and goal post on your pizza, or at least that is what the illustration seems to be suggesting.